The first time I saw Swami Kriyananda was in a tent set up behind the Beta Chi fraternity house on the campus of Stanford University, in Palo Alto, California. It was late November 1969. He was in his early forties. I was twenty-two years old. Usually the tent served as an expanded venue for the parties for which the fraternity was famous. It was the ’60s, though, and everything was changing. Someone thought it would be interesting to invite a swami to speak. I had attended Stanford University, but had dropped out after only one year. I had hoped to find teachers there who were not only knowledgeable, but also wise. It soon became apparent to me that my professors, though brilliant in their own fields, were groping in the dark for happiness even as I was. So I left. Soon after, I discovered the Bhagavad Gita and the teachings of Sri Ramakrishna. Even as a child, I had the feeling that something far more important was going on in life than most people were aware of. At first, I thought the adults around me were all in on the secret and were just holding it back from me as a kind of elaborate practical joke. “Soon,” I thought, “they will reveal it to me.” Only slowly did I come to know that this was not the case. My parents and teachers were good people, intelligent, honorable, and kind. For the most part, though, they accepted life as it appeared to be and expected me to do the same. Once I discovered Eastern religion, at least I had a name for what I was seeking: Self-realization. Still, I had no idea how to turn these high ideals into an actual way of life. I read about the saints of many religious traditions, hoping to find in their example a way to bridge the gap between theory and practice. Their stories were deeply inspiring and I devoured book after book. The circumstances of their lives, though, were so different from my own. Catholic monasteries, Indian ashrams, Himalayan caves, leper colonies in the middle of the jungle – their example proved to be of little practical value. My life was becoming one of quiet desperation. Then Swamiji walked into that tent and everything changed. I was in the last row of the bleachers, way up toward the top of the tent. I had wanted to be closer to the stage, but my companions insisted on this faraway perch. The choice proved felicitous, I daresay, God-inspired, for I was directly across from the entrance and high enough to have a unobstructed view of Swami Kriyananda when he walked in. Swami means teacher. Ji is a suffix denoting both affection and respect. From the moment I saw him he was Swamiji to me. The image of Swamiji coming through that doorway is as vivid in my heart today as it was the moment it happened. He was dressed in the traditional orange robes of an Indian Swami: a long loose fitting shirt and a sarong-like garment called a dhoti. He had a neatly trimmed beard and long hair, brownish in color, which hung straight and thin down his back. He was slender, a little less than six feet tall. He moved with a certain grace and gave the impression of great strength, although more like a dancer than an athlete. Later I heard the phrase “lion-like Swami.” It described him perfectly. The instant I saw him, the thought flashed in my mind, “He has what I want.” With a determined step and what I came to recognize as his characteristic posture—straight spine, slightly raised chest so as to meet life “heart-first”—he covered the short distance from the doorway to the stage at the center of the tent. By the time he reached the platform, before I even heard the sound of his voice, I had forged with Swamiji a lifelong bond. Somehow I picked up a few facts. Swamiji is an American, although he was born in Europe, and spent his childhood there. He is a direct disciple of Paramhansa Yogananda. He had been part of Self-Realization Fellowship (SRF), the organization Yogananda founded, but now he was on his own. He lived in San Francisco and taught classes all over the Bay Area to earn money for a community he was starting in the Sierra Nevada foothills, about four hours away. He called the community Ananda. I owned a copy of Yogananda’s classic Autobiography of a Yogi, but I had never read more than a few pages. The devotional tone and the plethora of miracles had not appealed to me. On page 9, the yogi Lahiri Mahasaya materializes in a wheat field to deliver a spiritual message to Yogananda’s father. I don’t think I even got to page 10. Now, with renewed interest, I tried again. If Swamiji was devoted to this book and its author, I had to give it another try. This time, I was enthralled. I couldn’t understand why Autobiography of a Yogi had not held my interest before. Later I understood that my first meeting with Swamiji opened my heart not only to him, but to Paramhansa Yogananda as well. It wasn’t long before I threw in my lot with Swamiji and moved to Ananda. The idea of writing this book came very early in my time with Swamiji. I have always had a deep longing to help others, but until I met him, I didn’t feel I had anything meaningful to give. Now I was eager to pass on to others all that I was learning. I began giving classes for guests at our retreat, which I filled with stories about Swamiji. I longed, though, to make a more lasting contribution. Though I hardly felt qualified to write a book, I began to write down my experiences with Swamiji. When I spoke to him about it, he was reassuring. In the many years that passed between the first time we spoke of it and when I actually began to write this book, Swamiji referred to it only occasionally. It was always in my mind, though, and, I believe, also in his, for I see now all the ways in which he helped me, just as he said he would. He included me in so many situations where I didn’t really belong except that to be there helped me understand the breadth of his work and the depth of his consciousness. Whenever his attitudes or actions were obscure to me, he would patiently explain what he was doing and why. Whatever I asked, he would answer. In this way, again and again I was able to test my intuition against his explanations, until gradually I gained the confidence to write this book. What follows is not a biography in the conventional sense. You will learn about many of the significant events and achievements of Swamiji’s life, but it is not a comprehensive account. There is no chronology or sequence to the stories that follow. Sometimes events from different time periods and different locations are included in the same vignette. 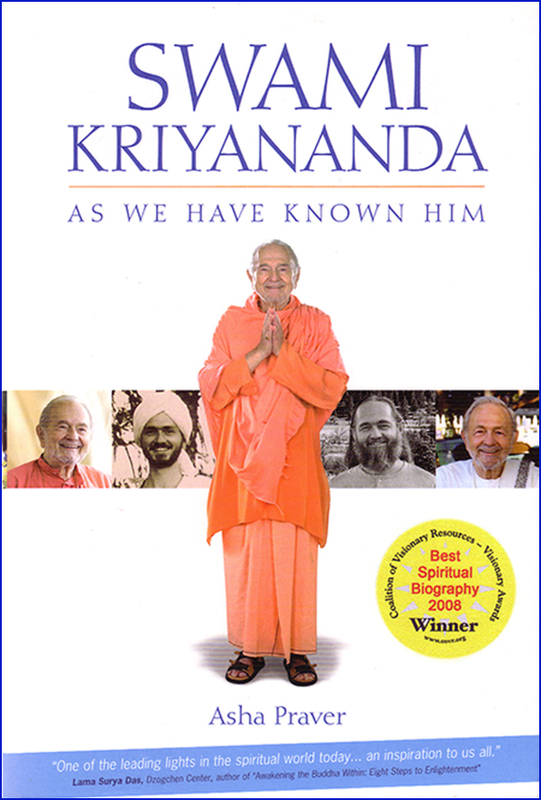 It is a biography of consciousness – Swami Kriyananda as we have known him. Many people have shared their stories with me. Some names are included; others have preferred to appear in the book only as “an Ananda devotee.” When there is no other attribution, the first person accounts are my own experiences. I have also described the experiences of others as I observed them, or learned about them from Swamiji himself. Names that appear first with an asterisk (*) are pseudonyms. Unless it is clear from the context that the individuals involved are from India, devotees referred to by a single Sanskrit name are Europeans or Americans upon whom Swamiji has bestowed these names as a spiritual blessing. Swamiji’s appointed spiritual successor, for example, is Jyotish, which means inner light. Jyotish’s wife, and partner in leading Ananda, is Devi, which is a name for Divine Mother. My name, Asha, means hope. The name Master refers only to Paramhansa Yogananda.